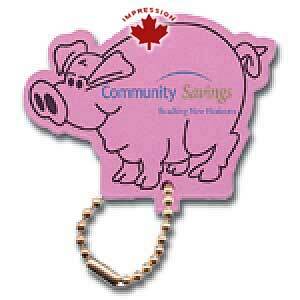 Pig Floating Foam keychain custom made in Canada and is also suitable as a luggage tag or zipper pull. 1 Colour imprint included $1.75 $1.50 $1.00 $0.95 each. The above price is for a project we just finished and a separate price will be supplied for your requirements. Our Canadian factory uses brightly coloured EVA foam to manufacture this floating key tag in these colours, Yellow, Mint Green, Black, Red, Orange, Purple, Pink, White and Royal Blue.